The Paper Bag Players: Stand Up & Cheer, We’re 60 This Year! Long an Emelin holiday tradition, The Paper Bag Players’ brand new show honors the troupe’s landmark 60th season with a blend of classic sketches as well as brand new works that together pay tribute to its rich history and ongoing creative vision. 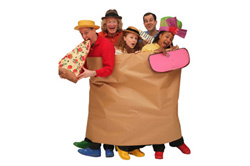 The family-friendly hour is brimming with lively music and dance, raucous audience participation, larger-than-life characters, sing-along songs and hilarious stories, all wrapped in signature paper and cardboard costumes and sets. Ages 3-8. The Emelin Family Series is Sponsored by Miller’s Toys.